Home PlayOJO casino – should you play there? PlayOJO casino – should you play there? PlayOJO casino is licensed by the Gaming Authority of Great Britain and abide by fair play rules, even detailing their principles in a ‘Play Manifesto’ (which impress!). What stands out about this casino is the character ‘OJO’ who is a player sidekick that helps you get the very best casino experience. PlayOJO maybe the new kid on the block, but it’s already proving to be a reputable, generous and unique casino that’s very rewarding to play. OJOplus is an exclusive feature that gives all players money back on every bet. 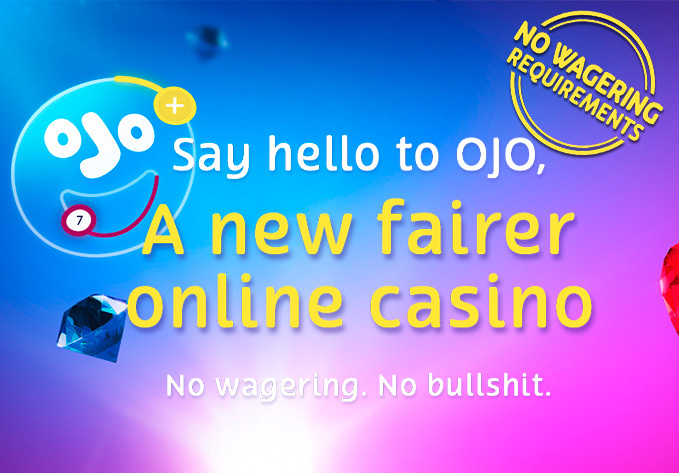 It’s true, from the very first bet, OJO will put money into your OJOplus account (separate from the real money account). OJO pays out on every single wager too, win or lose with no limits on how much OJOplus money you can earn. It’s as good as cash, you can play or withdraw the OJOplus cash at any time. This puts PlayOJO ahead of the online casino pack. There’s no shortage of choice when it comes to promotions. When you make the first deposit you get 1 Free Spin for every £1 you deposit (up to 50). PlayOJO refer to their perks as ‘Kickers’, players can enjoy a new offer each day in the Kicker section, if you’re ‘not feeling’ the offer then you can check back the next day for a new Kicker. You’ll be spoilt for choice at PlayOJO, this casino has over 1000 games from table favourites, live casino play and lots of slots from progressive jackpot to the latest releases. You can find great branded titles too like Guns N’ Roses, Game of Thrones and Motörhead. PlayOJO casino work with all the biggest names in gaming developers including NetEnt, AMAYA, Barcrest, Microgaming, WMS, Evolution, Yggdrasil, NextGen and plenty more. PlayOJO even produce their own in-house slots under the GVG brand, they have the likes of Hot Wheels, Safe Hackers and the famous Ninja Master slot to their name. Of course, you will find there BTG: White Rabbit, Bonnanza, Danger High Voltage. All bonuses are paid in cash – No wagering requirements on anything. EVER! Join now PlayOJO, you’ll get 50 free spins on your first deposit +30 extra free spins from mrBigSpin. All spins without wagering!